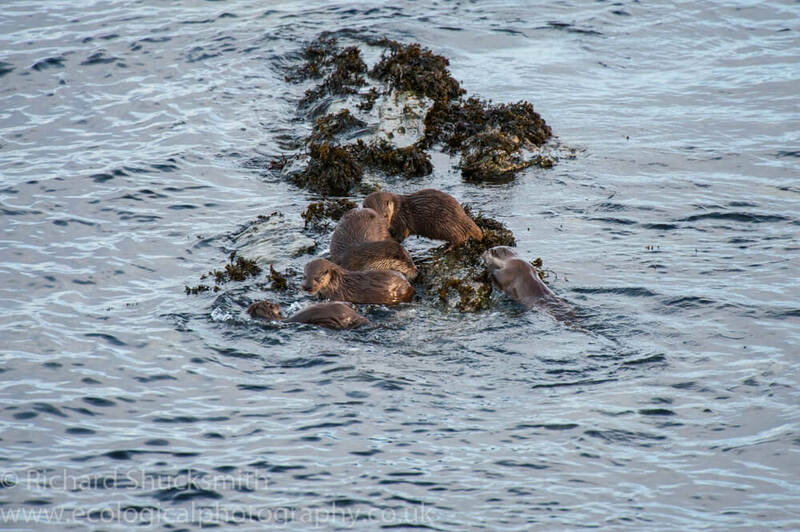 It turned into a special a day for following Shetland otters. I had decided to go and walk a stretch of coast to look for otter that I had not walked for quite awhile. It had constantly been in the back of mind this autumn/winter as a place where I should go and check on the otters living in this area. So with a good snow fall the day before, I walked along the road till I met the track that takes me down to the bay. There were a lot of birds about in the bay due to the cold weather and it all looked wonderful in the snow. As I walked along the shore I wondered if I would get the otter in the snow picture I had been thinking about for last few months. Due to the cold weather there was numerous snipe feeding amongst the seaweed, along with turnstones and several whooper swans where a stream entered the bay. I was looking for otter tracks as well as scanning the shore line and it wasn’t until I was round the other side of the bay that I came across fresh foot prints in the snow. Small foot prints as well as larger ones; this looked like a mother and cub. Two Shetland ponies had started to follow me, hoping I had some food and kept nuzzling at the camera bag. I followed the tracks over a 30m bit of land that created a point between two bays. I stopped and scanned no sign of the otters. I walked to end of the point and scanned no otters, no tracks or spraints. I started walking back along the point into the next bay when I heard that familiar ‘whistle’ of an otter cub. They did not sound far away but I could not see them. They seemed to be getting closer heading towards the point. I moved to the end of the point and hid in a dip and watched the shoreline. Few minutes later a young otter appeared calling but moving with a purpose. Few seconds later another young otter appeared also moving with a purpose. They came strait past me, and the point to an island 30m away. I was watching the two cubs come out on the island and wondering where is mum? Then I heard a ‘huff’ behind me, I slowly turned my head to see mum otter had come out the water and was no more than two meters away. She was edging closer to the Shetland pony that had been following me round the shore. The female otter got within two feet of the Shetland pony and the pony charged. The otter turned and at full speed ran right past me, within inches to the end of the point, jumped in and disappeared. Thirty seconds later she surfaced next to the island and joined the cubs. My heart was pounding. I watched them on the island for a while and then they disappeared. I was wondering if they were going to stop on the island, when I saw the group leave and head across the bay to the opposite point. Now for the otters it’s a 200m swim, for me to get where the otters were going it’s a kilometre plus run. I made the decision to follow but they had a head start and otters have a great ability to disappear. I was thinking, I will probably struggle to find them once I make it round as it will be at least 10 minutes before I get there. I started off at a run but soon slowed down to a walk/run. I got half way round the bay and scanned with my binoculars and saw the family of the point. I carried on with what felt like my heart pounding out of my chest, sweating profusely and struggling to breath. It was dam hard running in snow with my camera gear. As I got round the bottom of the bay I decided to cut across the headland, as I suspected that the otters had moved round the point and into the next bay. As I came over the headland and into the next bay a slowed down and tried to scan with my binoculars but they kept steaming up with the heat from my face. 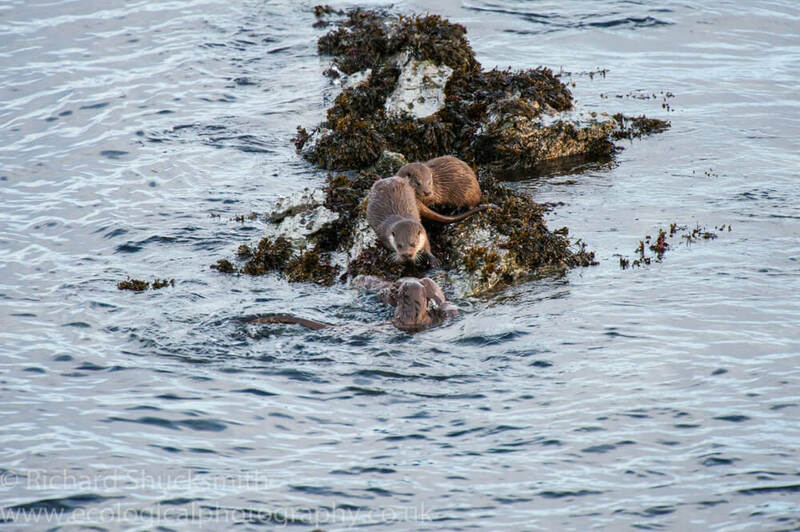 I was catching my breath and looked along the coast to the point and there I saw the familiar sight of several otters diving. I moved towards the point and as I got closer I crawled on my belly until I could see the otters and the rocky coast below me. I was a little high for taking photographs but I watched to see what the otters were doing. 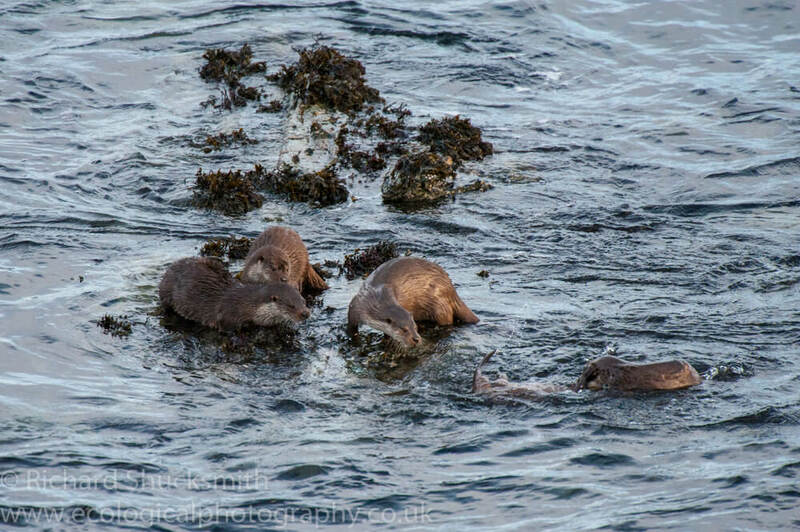 There were two cubs and their mum but I kept thinking I was seeing another otter further to the left. 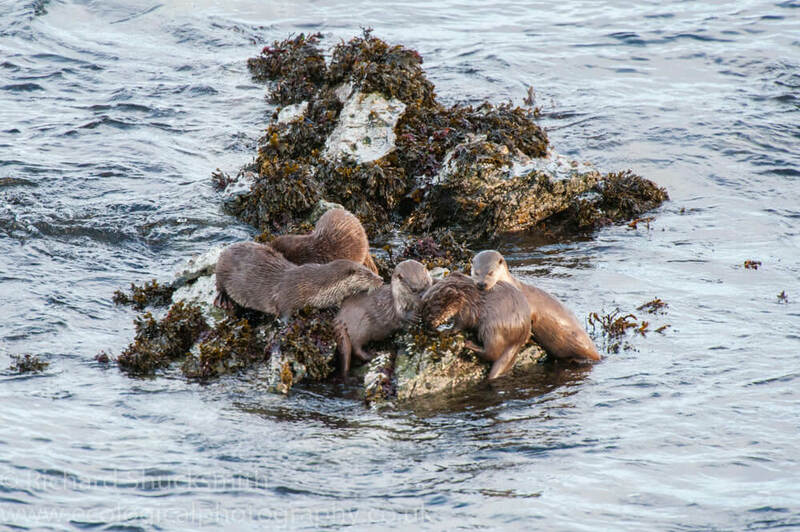 A rocky reef had broken the surface as the tide was going out and a mum and cub clambered out on the rocks. Thinking this was part of the family I had been watching, I was astounded to see the two cubs appear near the rocky reef playing. So she had three cubs not two. Then another otter appeared with the two cubs. The otter and cub on the rock looked a little apprehensive. Then I realised it was a mother with a single cub and the mother with her two cubs. 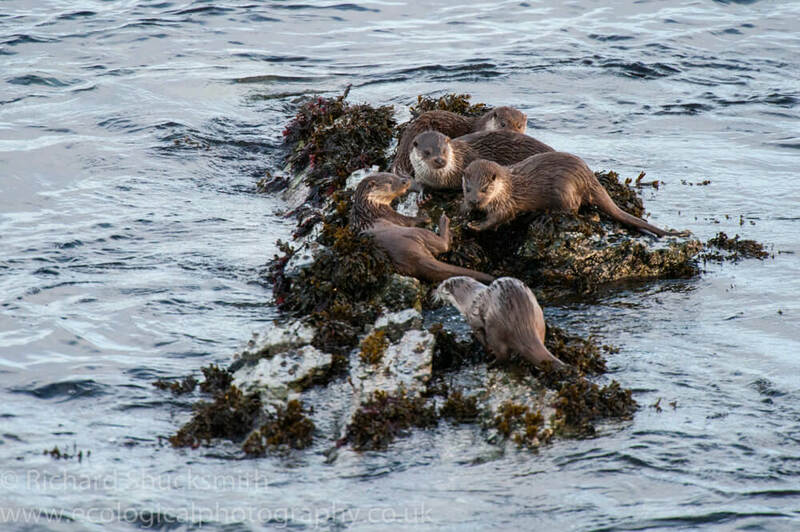 I couldn’t believe it, five otters altogether what a sight! 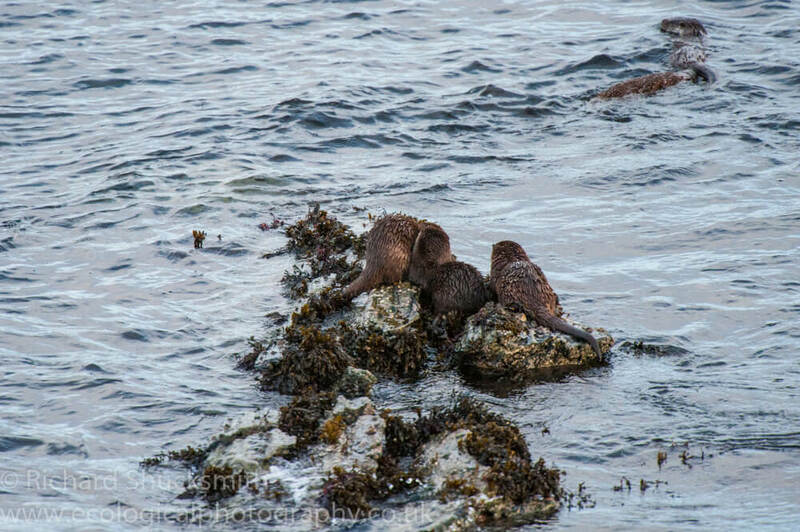 Here the mother with a single cub is out on the rocky reef and the two cubs are playing totally unperturbed to the other otters being there. Here the mother from the two cubs which are still playing comes out to see the mother with the single cub. Here you can see the two mothers greeting each other. 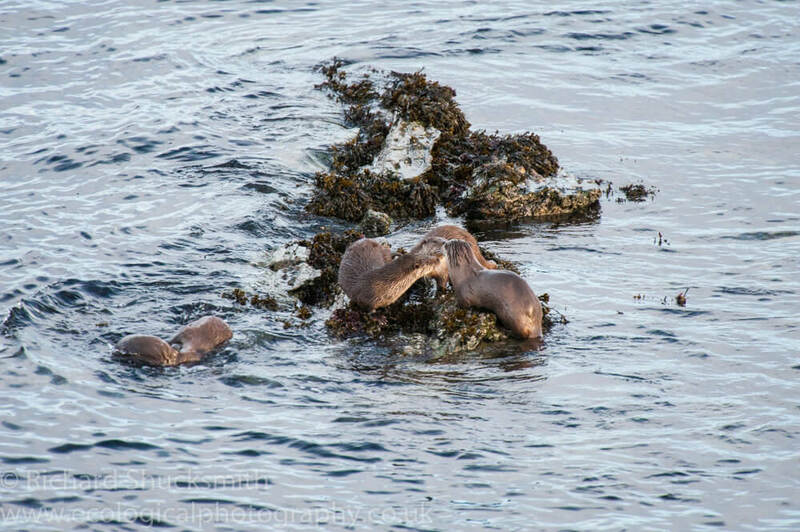 There most likely mother and daughter from previous years and the daughter has took up residence in the neighbouring range but otters have overlapping ranges with their neighbours. Here you can see the mother of two cubs sniffing the females single cub. They look incredibly comfortable with each other, likely the mother and daughter from previous years. 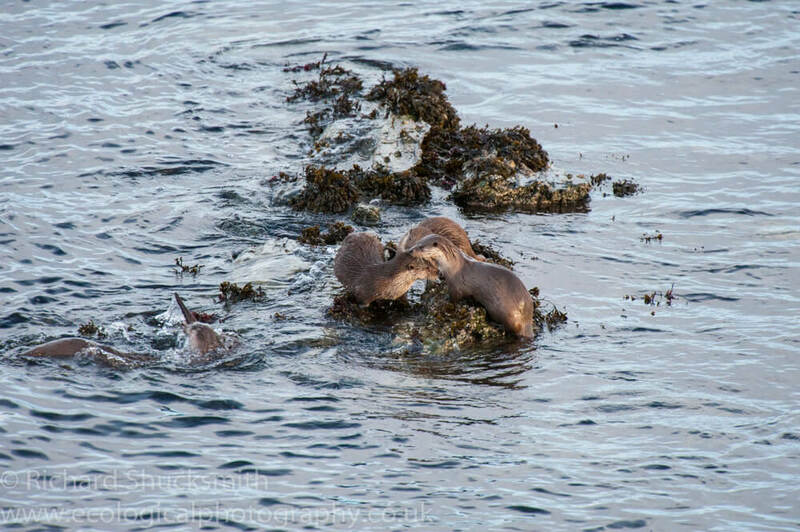 The two cubs coming to join their mum and investigate the other otters. However always wanting to play (learning life skills) the two cubs start play fighting. They all come out on the rocks. The mother takes her cub into the water and leaves the mother with her two playful cubs and heads off along the coast. The whole family watches them swim away and go further along the coast. Within a few seconds the mum takes her two cubs, and heads off in the other direction, out across the bay to some island that are further out. After a while I lose sight of them amongst the waves and wonder where they’re heading? I see the mother with the single cub one more time and then I lose her to. I think the mum with the single cub was probably already at the point when the other family turned up. They had spent a good 10 minutes if not longer together and it was fascinating to watch. 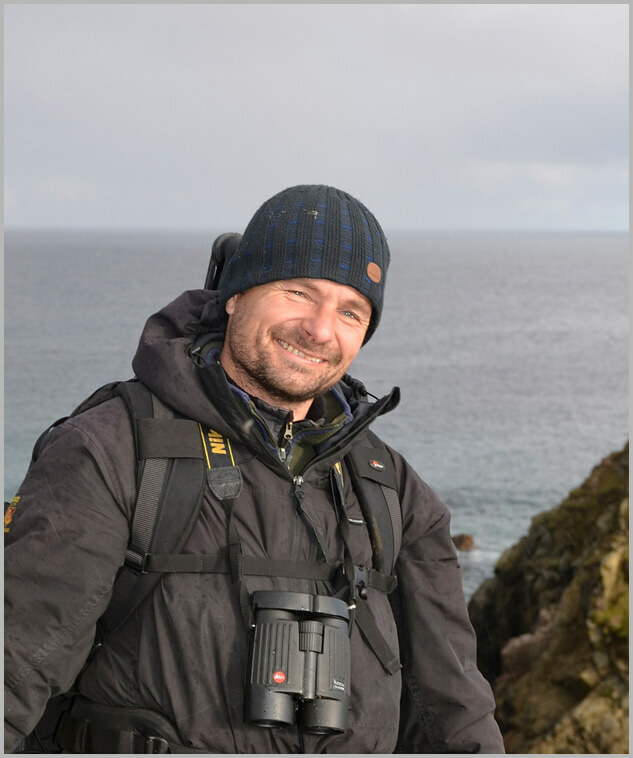 The agonising run around the bay was a distance memory, a great day with Shetland otters. 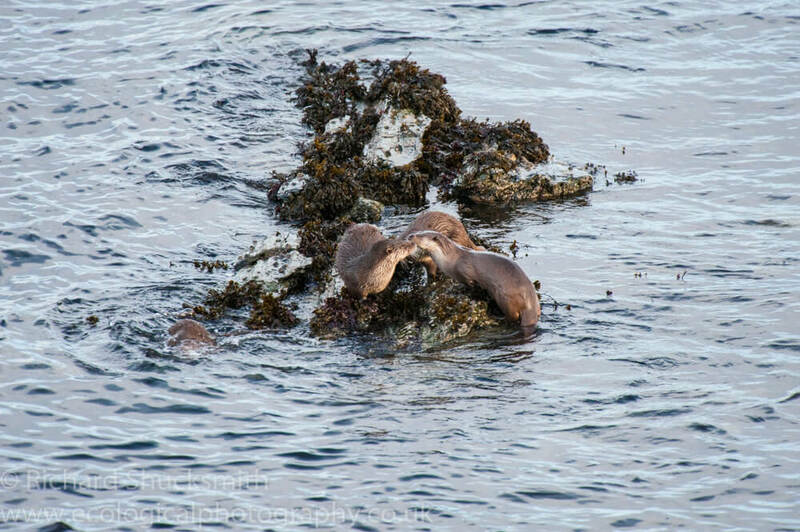 In conclusion a female otter will take up resident on a stretch of coast and that becomes her range. During this time she will have cubs. The male cubs when reach maturity will get pushed out of the female/mother’s range because the female otter does not want to mate with her son. However the daughter could set up a range that overlaps her mother’s territory. The daughter then has cubs and some days they are in the same area doing what otters do, catching fish and for a short time they will be together before going about their daily life. How much this actually happens is difficult to know but I suspect more than what we see. It is known that some daughter’s see their mum almost on a daily basis well after they have parted company and have cubs of their own.